Fruit salad, girls? 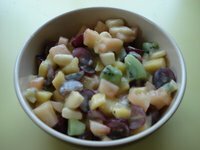 Fresh from the garden, I chopped up some plums, pineapple, grapes, bananas, & kiwi. Dressed it with non-fat peach yogurt, and, viola! lunch! Ok, ok... you caught me. Maybe I didn't grow the pineapple. I have yet to master that plant. But our small vineyard has produced exceptionally well this summer, according to the previous owners, so we're really pleased. Care to join me? Come on over. The east garden gate will be open for you. I'm back by the pool. So, I'm guessing you "grow-your-own" organically? And what to drink with that nice, light salad? Of course, its organic, hun! As for the beverage to accompany this? 'Mom'osas or 'mama'tinis.. your choice, doll!